Define and discuss with your counselor the following disabilities awareness terms: disability, accessibility, adaptation, accommodation, invisible disability, and person-first language. Visit an agency that works with people with physical, mental, emotional, or educational disabilities. Collect and read information about the agency's activities. Learn about opportunities its members have for training, employment, and education. Discuss what you have learned with your counselor. Talk with a Scout who has a disability and learn about the Scout's experiences taking part in Scouting activities and earning different merit badges. Discuss what you have learned with your counselor. Talk with an individual who has a disability and learn about this person's experiences and the activities in which this person likes to participate. Discuss what you have learned with your counselor. Plan or participate in an activity that helps others understand what a person with a visible or invisible disability experiences. Discuss what you have learned with your counselor. Present a counselor approved disabilities awareness program to a Cub Scout pack or other group. During your presentation, explain and use person-first language. Find out about disability awareness education programs in your school or school system, or contact a disability advocacy agency. Volunteer with a program or agency for eight hours. 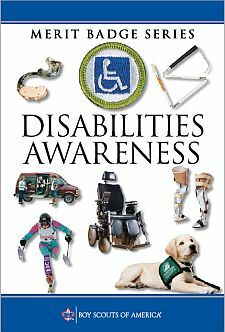 Using resources such as disability advocacy agencies, government agencies, the Internet (with your parent's permission), and news magazines, learn about myths and misconceptions that influence the general public's understanding of people with disabilities. List 10 myths and misconceptions about people with disabilities and learn the facts about each myth. Share your list with your counselor, then use it to make a presentation to a Cub Scout pack or other group.